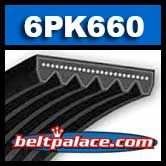 6PK660 AUTOMOTIVE Micro-V Belt. Made by BANDO USA. 660mm Length. 6 Ribs. 6PK660 EPDM AUTOMOTIVE Micro-V Belt. Made by BANDO USA. 660mm Length. 6 Ribs. 6PK680 Automotive Serpentine (Micro-V) Belt. 680mm x 6 ribs PK (K) Section. Metric 6PK680 Serpentine Belt. 680mm Effective Length, 6 Ribs.